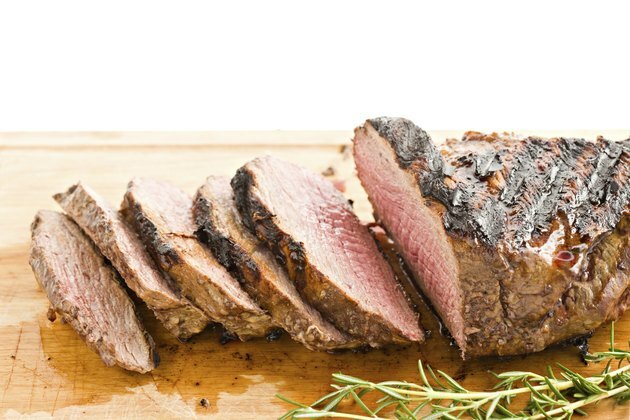 Tri tip roast, also known as triangle roast, is cut from the bottom sirloin and is a fairly small roast, usually weighing only 1 1/2 to 2 pounds. Tri tip roasts, unlike chuck roasts, are naturally tender and don't require a long cooking time to tenderize them. However, cooking them in a slow cooker is a simple, convenient method. Add vegetables if you wish to make a pot roast, or serve tri tip alone. Add butter and flour to the drippings to make a savory gravy. Remove the roast from its package and pat it dry with a paper towel. Heat a skillet over medium-high heat until hot. Spray the skillet with non-stick cooking spray. Add the roast to the skillet and brown it 3 to 4 minutes on each side until the roast is very brown and caramelized. This browning process seals the juices and adds flavor. Liberally salt and pepper the roast and spread minced garlic on it. Put the roast in the slow cooker and pour the red wine over it. Tri tip roasts don't need additional liquid for tenderness, but the red wine adds flavor. Replace the lid. Cook the roast on high for one hour. Cook for an additional two to three hours on low. Tri tip roasts don't take as long to cook as other roasts because of their small size. Insert a meat thermometer into the roast. It is medium-rare when the thermometer reads 150 F, medium-well at 165 degrees. Move the roast to a serving tray and cover it with aluminum foil. Allow it to rest for 10 minutes before cutting it to allow the juices to settle in the meat, ensuring easy slicing and a juicy roast. Slice and serve tri tip roast as a tradition roast or use it for sandwiches or shred it for burritos.